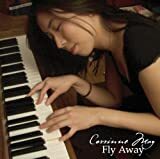 Corrinne May is a Los Angeles-based, Singaporean musician, singer, and songwriter. She graduated from the prestigious Berklee College of Music in Boston, and began her career as a singer-songwriter in Los Angeles. Her debut album Fly Away, which included a song with Carole King and Carol Bayer Sager titled "If You Didn't Love Me", was released in 2001. To date, she has released five albums, the latest being Crooked Lines in 2012.